And I don’t mean it’s administered by a Ferengi starship commander, either. A daemon is a program that runs in the background. Every decent operating system has daemons, or it would hardly be useful for us ordinary mortals. But this one particular daemon, named systemd, is a dangerous, invasive, “supervisory” one that does more than just initialize programs and applications and allocate the proper resources to them. It oversees, overrules, overextends, and keeps a record of every process. It has many security vulnerabilities and other issues that sent me fleeing away, at least until it can be tamed and put on a leash or something, if ever. I wanted a Linux distribution that was not only not possessed by that evil daemon, but also beginner-friendly and technophobe-friendly. Salix would have sufficed in the first department, but not really in the second. A little more research and I re-discovered PCLinuxOS. There’s a nice community Xfce edition with lots of extra stuff in it that I actually don’t need or want, but that is true of every newbie-friendly Linux mixture. I found a “Xfce mini” edition, put together by the revered and praiseworthy Ika, a long-time member of the very loyal and enthusiastic PCLOS community. I installed it today on the old laptop and just wanted to describe the experience a little, for the benefit of any readers who are looking to escape the systemd threat without losing the simplicity and “friendliness” of wonderful Linux distros like Mint, the ‘buntu family, LXLE, Linux Lite, ElementaryOS, and many more built from Ubuntu. For them, if they have decent hardware that isn’t more than a couple of years old, there is the flagship KDE edition of PCLinuxOS. It has it all! I prefer the lightweight, infinitely configurable, and super-simple Xfce desktop. It’s the default desktop of Linux Lite, and also the default desktop of several Linux distributions meant for use by children! So it’s not complicated, but it’s powerful, simple, and nimble on older hardware. The Xfce flavor of PCLinuxOS is available in two different forms: The standard one is basically kinda sorta PCLinuxOS with Xfce tied on. The “mini” Xfce version has few installed applications, just enough to run it and then install the software you really want and prefer to use. It uses Synaptic Package Manager (yeah, you read that right, Synaptic, even though it’s not Debian or Ubuntu-based) to update and install software from a vast, hyooooge, very extensive repository! It even has Seamonkey! Cool, no adding PPAs and all that high-risk nonsense. LXLE has like six or eight added PPAs besides Ubuntu’s, just to get the latest versions of LibreOffice, to make Seamonkey available to their users, and the latest daily builds of other popular software. That’s nice, but the more PPAs you add to an Ubuntu-based OS, the greater the risk of something breaking when installed and/or updated. My other complaint with Ubuntu-based distros is the inexplicable presence of beta software in a distro intended for novice users! I just think that is unconscionable. Systemd, by the way, is beta quality even if it’s not billed that way. Okay, end of lecture on why I switched (and why others should, in my opinion). Now the good part. The Xfce Mini Live USB cranked right up and ran fast and responsively in Live mode. Installation may be unfamiliar to folks who are used to the Ubuntu-based stuff, but it’s pretty easy. 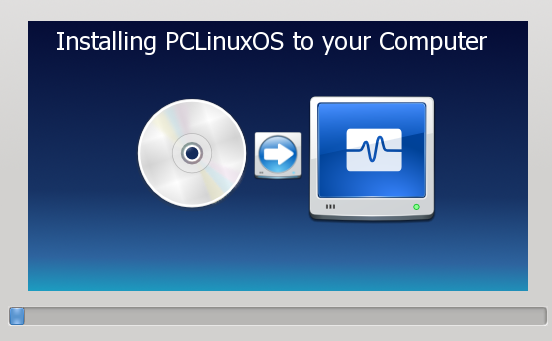 Clicking on the “install PCLinuxOS” icon brings up a nice step-by-step set of instructions. The DrakLive installer uses GParted, but helps the user along. BACK UP ALL YOUR STUFF to an external media first! WORD OF CAUTION: If you already have a /home directory on the drive that you used with a different distro, format that sucker! “Foreign” settings and stuff will definitely interfere with PCLinuxOS default settings. Keep your documents, pictures, videos, browser / email profiles etc on external media to use after installation. Now tell the installer what bootloader and device you want to use. 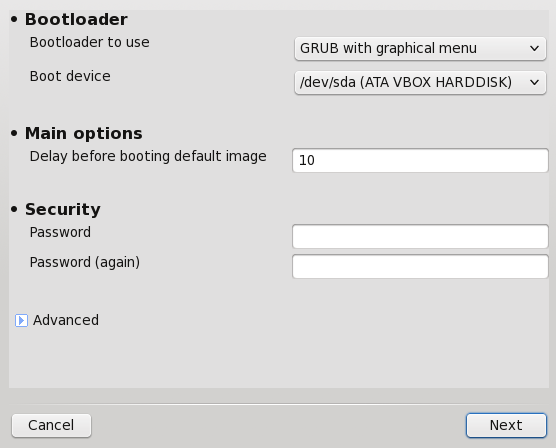 The default is Grub on the hard drive. Ohhhh, it’s wonderful! The entire process from start to finish took under 10 minutes on my laptop. My only issue was that I needed to use my little non-proprietary USB wifi dongle to get an internet connection. That’s common with the stupid Broadcom wireless hardware in Dell computers. Not a show-stopper really, just a minor annoyance. Easily fixed after installation. On a desktop with a wired internet connection, no issue at all. Then reboot when it’s finished, but do not remove the Live media (USB or DVD) until prompted to do so. 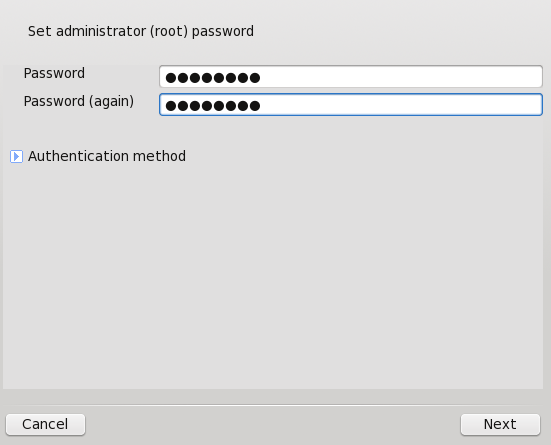 On first boot, you’ll choose your root password and set up a user (with a different password – this ain’t Ubuntu!). Log in and enjoy! The mini Xfce version has enough to get you going. First thing: Update! You can do it when prompted to, but on the mini you’ll want to open Synaptic and choose your favorite apps. I install Seamonkey, ddCopy, xournal, Faenza icon set, and a few other favorites. LibreOffice isn’t included in the mini version, so install it from Synaptic if you want it. GParted and ddCopy do what Mintstick did in Linux Lite (and Mint), so I’m comfortable with that. This is a truly customized mixture, and the cool thing is, you can use MyLiveCD to roll your own custom-made, just-the-way-you-want-it iso to install on another computer. It does what Systemback did (and by the way, Systemback is about to lose it’s maintainer, so it may not be available in the next LTS releases of Ubuntu and it’s derivatives). I’m just enjoying this so much, and I feel so much better to have exorcised the systemd daemon from my OS. Found the mini version of XFCE and you were right, of course, much more manageable. This DOES look like a winner now! Thanks. GREAT!! I bet you’ll love it! It’s more than just a Linux distro though. It’s whole community of awesomeness, and members enjoy free IMAP e-mail, photo hosting, the monthly magazine (which published an article and screenshot of mine in the July issue! ), and a very active forum where all the developers and contributors participate. Seamonkey is in the repositories if y’want to check it out. If you want LibreOffice, look for a package called lomanager in Synaptic and install that. Then run “LibreOffice Manager” after you quit Synaptic. It’s a way to keep the really big packages in reserve for the really big repository servers and decrease the burden on the volunteers who manage the other repository servers. Kinda cool actually. Add GStreamer codecs (good, bad, and ugly) for media. There’s no annoying beta PulseAudio unless you install something that depends on it. There’s plenty of very friendly advice right here but better advice in the forums! Oh, and I almost forgot: Look under Graphical Desktop Environment Xfce to find sweet Xfce-integrated applications like the Ristretto image viewer, Parole music player, etc. Find that category by clicking on SECTIONS (lower left) in Synaptic. backup DVD with installed apps and user data after making a Live ISO. suggestion as to which repository is fastest for someone in USA? CHEERS! Okay, after hours of bungling, I am happy to KEEP “PCLinuxOS” on my portable machine! Great! along with the PCLOS and that Xfce-Mini….and followed your instructions, except that Seamonkey wouldn’t sync, and Firefox would. Sad, really, as I have Seamonkey on my desktop. Thanks for all your help, Robin. Keep posting! Any chance of the link to the mini XFCE, not seeing it in community, only regular XFCE? There are links to both the “regular” and “mini” Xfce versions there, along with md5sums. How doe’s it fair with the dreaded “Screen Tearing”? I don’t experience any screen tearing, but I don’t put much demand on the computer anyway. Do they have a stable Mate release? I think that would be an option, If screen tearing is an issue, also compiz window manager is messed up in XFCE, except Manjaro it seems, guess I could use compton, that should work but some eye candy is always nice…. Yessir! We have Mate, Xfce, even Enlightenment! I read the article, I have about 18 mths experience with Linux, tried most known distro’s, loved UB Mate for a while, then upgraded my Nvidia card, and all font rendering went kaput on Desktop after some Nvidia upgrade so, moved around, settled on Xubuntu, I have capable machines for whatever but like the weight & customizability (is that a word?). have seen your posts on ORCA, I too tried Manjaro, have it up on a PC as I type, kind of at that crossroad, which way to go. The Mate version is a rolling release I believe, some trepidation there but it’s no worse than Manjaro in that respect but probably moves slower. I shall download it and give it a spin!! You take for granted the “Buntu’s and get used to a certain way of doing things but change is good, right? I’ve been using PCLinuxOS in its many forms for a very long time now. I find that other distros (and Windoze) totally throw me now, but with almost any PCLinuxOS desktop there’s always a way out of anything wrong, and I can figure out most problems. My main criticism of it is not to do with PCLinuxOS itself, but that KDE desktop has become too unwieldy. I also use the community XFCE4-base and build up from there, and it’s fast despite loads of features, and you have to love the XFCE4 developers for making it really attractive (it was ugly in its early days) and functional. The ideal desktop! I have to choke on my words here, as I say that the PCLinuxOS community has tamed the beast that is KDE5, and the “Darkstar” release, a minimal KDE5, is usable and fun!